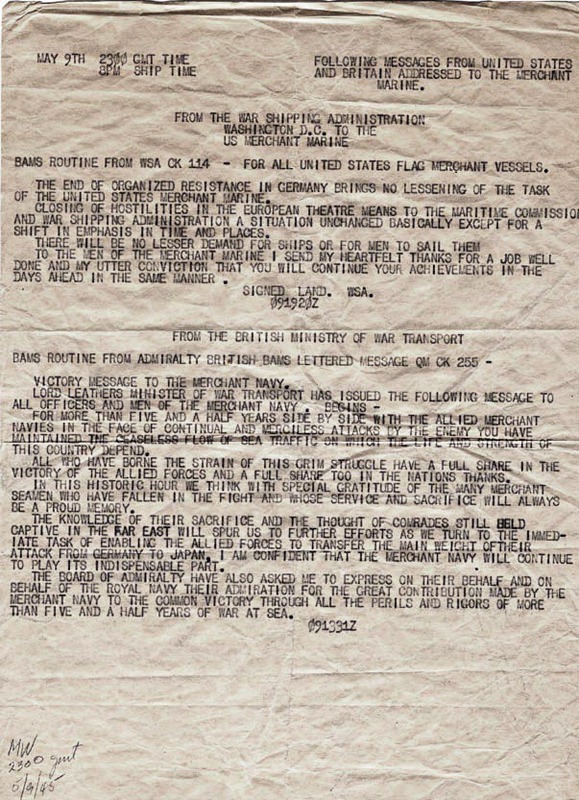 BAMS (Broadcast to Allied Merchant Ships) were messages sent out to merchant ships at sea. There were also messages aimed at specific ships or convoy members, ship to ship messages, etc. 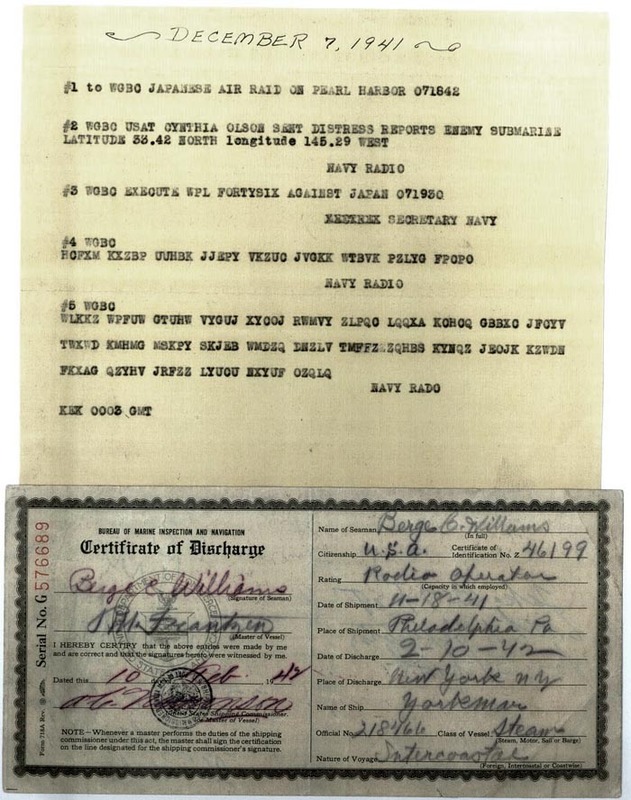 December 7th, 1941 Air Raid on Pearl Harbor - Message received by Radio Officer Berge Williams aboard the SS Yorkmar - submitted by Berge Williams - Class A-1 (SIlent Key). *1 - Call letters for the SS Yorkmar - Sunk by U-645 on 9th Oct 1943 - 13 dead and 54 survivors. *3 - Navy Basic War Plan WPL-46 (Code Name Rainbow No. 5). The only problem was, it was a secret document, and very few copies existed. ** This is to the best of Berge's recollection. "On that fateful Sunday we were steaming off the west coast of Mexico bound for Panama from San Francisco. I was the radio operator of the S.S. Yorkmar, a freighter, under the command of Captain P.M. Frantzen. That morning I had been on watch for three hours but heard nothing out of the ordinary. After lunch I again went on watch for two hours before sacking out for my afternoon snooze. At this time I always transmitted the ship's weather to all ships who cared to receive it. Upon completion of the weather report another ship contacted me and asked me if I had heard that Pearl Harbor had been bombed. Of course, this was a complete surprise to me and when I informed the bridge they were incredulous. It wasn't long before we began to receive official confirmation of the facts related to the 'Day of Infamy'. May 9th, 1945 German Surrender - U Boats are not to be Attacked. TO REMAIN ON THE SURFACE FLYING A LARGE BLACK OR BLUE FLAG BY DAY AND BURNING NAVIGATION LIGHTS BY NIGHT. 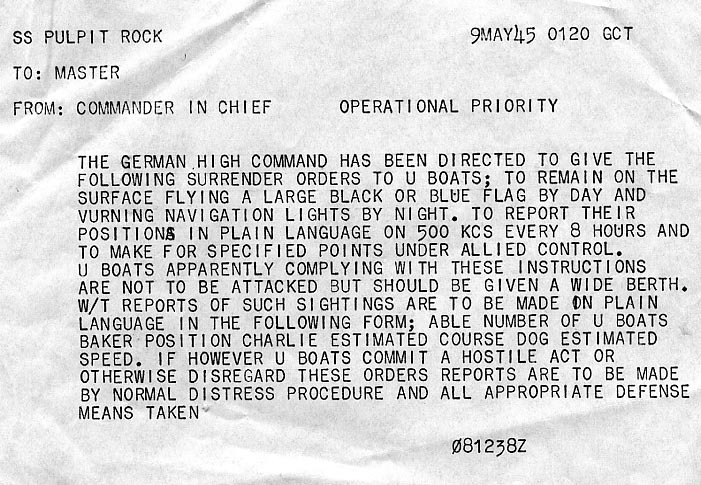 TO REPORT THEIR POSITIONS IN PLAIN LANGUAGE ON 500 KCS EVERY 8 HOURS AND TO MAKE FOR SPECIFIED POINTS UNDER ALLIED CONTROL. U BOATS APPARENTLY COMPLYING WITH THESE INSTRUCTIONS ARE NOT TO BE ATTACKED BUT SHOULD BE GIVEN A WIDE BERTH. May 9th, 1945 - Unconditional German Surrender - Cease Fire has been Ordered. GERMANY HAS SURRENDERED UNCONDITIONALLY. CEASE FIRE HAS BEEN ORDERED FROM 2201 GMT 8TH MAY REPEAT 2201 GMT 8TH MAY. TWO. PENDING FURTHER ORDERS ALL EXISTING INSTRUCTIONS REGARDING THE DEFENSE, SECURITY AND CONTROL OF MERCHANT SHIPPING ARE TO REMAIN IN FORCE. MERCHANT SHIPS AT SEA WHETHER IN CONVOY OR SAILING INDEPENDENTLY ARE TO CONTINUE THEIR VOYAGES AS PREVIOUSLY ORDERED. 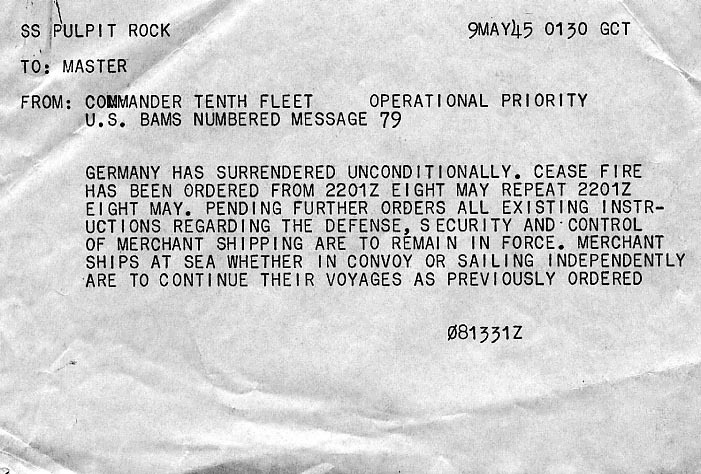 May 9th, 1945 (6 Minutes after the above BAMS, but from US 10th Fleet) - Unconditional German Surrender - Cease Fire has been Ordered. GERMANY HAS SURRENDERED UNCONDITIONALLY. CEASE FIRE HAS BEEN ORDERED FROM 2201Z EIGHT MAY REPEAT 2201Z EIGHT MAY. PENDING FURTHER ORDERS ALL EXISTING INSTRUCTIONS REGARDING THE DEFENSE, SECURITY AND CONTROL OF MERCHANT SHIPPING ARE TO REMAIN IN FORCE. MERCHANT SHIPS AT SEA WHETHER IN CONVOY OR SAILING INDEPENDENTLY ARE TO CONTINUE THEIR VOYAGES AS PREVIOUSLY ORDERED. 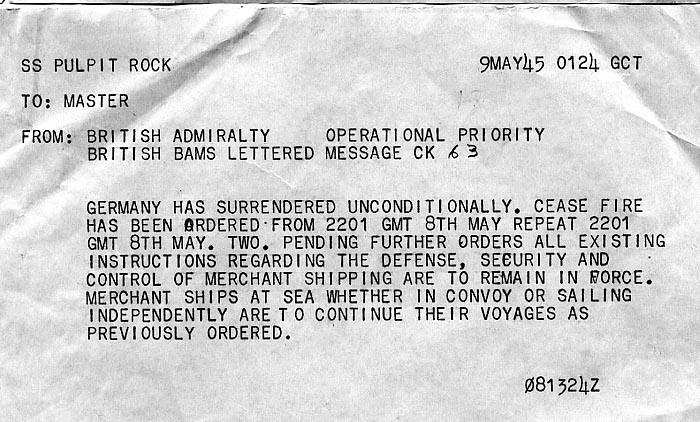 May 9th, 1945 - Combined message from United States and Britain - Unconditional German Surrender brings no lessening of the task of the Merchant Marine. BAMS ROUTINE FROM WSA CK 114 - FOR ALL UNITED STATES FLAG MERCHANT VESSELS. THE END OF ORGANIZED RESISTANCE IN GERMANY BRINGS NO LESSENING OF THE TASK OF THE UNITED STATES MERCHANT MARINE. CLOSING OF HOSTILITIES IN THE EUROPEAN THEATRE MEANS TO THE MARITIME COMMISSION AND WAR SHIPPING ADMINISTRATION A SITUATION UNCHANGED BASICALLY EXCEPT FOR A SHIFT IN EMPHASIS IN TIME AND PLACES. THERE WILL BE NO LESSER DEMAND FOR SHIPS OR FOR MEN TO SAIL THEM. TO THE MEN OF THE MRCHANT MARINE I SEND MY HEARTFELT THANKS FOR A JOB WELL DONE AND MY UTTER CONVICTION THAT YOU WILL CONTINUE IN ACHIEVEMENTS IN THE DAYS AHEAD IN THE SAME MANNER. FOR MORE THAN FIVE AND A HALF YEARS SIDE BY SIDE WITH THE ALLIED MERCHANT NAVIES IN THE FACE OF CONTINUAL AND MERCILESS ATTACKS BY THE ENEMY YOU HAVE MAINTAINED THE CEASELESS FLOW OF SEA TRAFFIC ON WHICH THE LIFE AND STRENGTH OF THE COUNTRY DEPEND. ALL WHO HAVE BORNE THE STRAIN OF THIS GRIM STRUGGLE HAVE A FULL SHARE IN THE VICTORY OF THE ALLIED FORCES AND A FULL SHARE TOO IN THE NATIONS THANKS. IN THIS HISTORIC HOUR WE THINK WITH SPECIAL GRATITUDE OF THE MANY MERCHANT SEAMEN WHO HAVE FALLEN IN THE FIGHT AND WHOSE SERVICE AND SACRIFICE WILL ALWAYS BE A PROUD MEMORY. THE KNOWLEDGE OF THEIR SCARIFICE AND THE THOUGHT OF COMRADES STILL HELD CAPTIVE IN THE FAR EAST WILL SPUR US TO FURTHER EFFORTS AS WE TURN TO THE IMMEDIATE TASK OF ENABLING THE ALLIED FORCES TO TRANSFER THE MAIN WEIGHT OF THEIR ATTACK FROM GERMANY TO JAPAN. I AM CONFIDANT THAT THE MERCHANT NAVY WILL CONTINUE TO PLAY ITS INDESPENSIBLE PART. September 6th, 1945 - Ships not to Zig-Zag - Guns need not be Manned. "I copied this message aboard the SS Tucson Victory in the Western Pacific right after the Japanese Surrender. We were diverted to Yokohama where a look at the total destruction of their industrial area by pre-invasion precision bombing brought home the real significance of the message - they had been still fighting despite this destruction and no doubt would have continued if not for the A-bombs. This, thankfully, was my last voyage. It was over!" 1. AS OF 0001 GCT 6 SEPTEMBER SHIPS WHETHER SAILING IN CONVOY OR INDEPENDENTLY ARE NOT TO ZIG-ZAG AND GUNS NEED NOT BE MANNED. SHIPS ARE TO BURN NAVIGATION LIGHTS AT FULL BRILLIANCY AND BLACKOUT REGULATIONS ARE CANCELLED. VESSELS ARE TO OBSERVE INTERNATIONAL REGULATIONS FOR THE PREVENTION OF COLLISION AT SEA. MASTERS ARE REMINDED OF THE IMPORTANCE OF MAINTING AN ADEQUATE LOOKOUT. 2. A SERIOUS DANGER FROM MINES WILL CONTINUE FOR SOME TIME AND MASTERS WILL NOTE WIMS ONE CHAPTER 15 FOR INSTRUCTIONS ESSENTIAL FOR THE CONTROL AND SAFETY OF MERCHANT SHIPPING. 3. RADIO TRANSMITTERS MAY BE USED FOR ESSENTIAL SHIPS BUSINESS AND WEATHER REPORTS BUT PERSONAL MESSAGES ARE NOT PERMITTED.